Judith Fein’s small stature and casual demeanor may give the appearance of a gentle woman, but make no mistake, as the cliché goes, there’s more to Fein than what meets the eye. Fein teaches a Monday night self-defense class to about 50 SF State students, most of them female. Originally from New York, Fein was first introduced to martial arts while serving in the Army during the Vietnam War. As a military intelligence captain stationed in Korea, and the only woman in her unit, Fein was often restless. With disciplined practice, Fein acquired her black belt in less than a year. While in Korea, Fein was harassed and discriminated against because of her gender. After resigning her commission in the Army, she decided to make a difference by teaching self-defense to others. Upon her return to San Francisco, Fein was the subject of a newspaper article. Wadsworth Publishing Company took notice, and asked her to write a book. 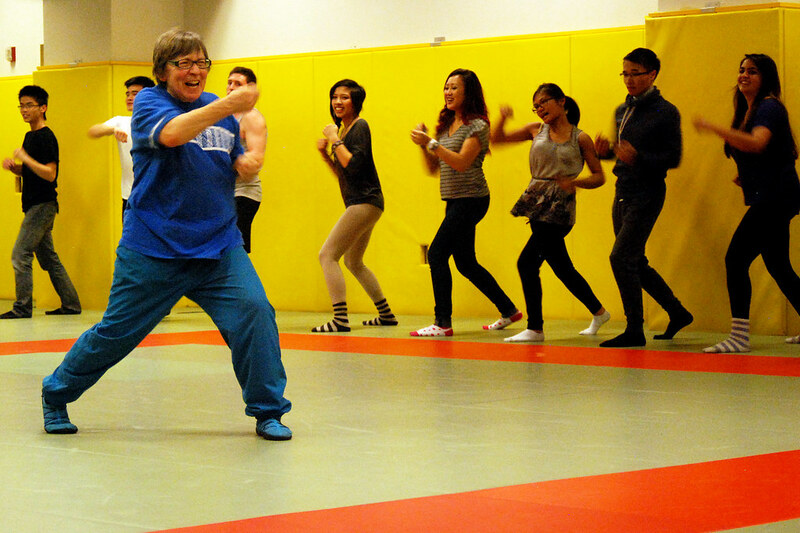 Fein has now been teaching self-defense for more than 38 years, and currently runs the programs at both SF State and City College of San Francisco. She says the most rewarding part of the job is the feedback she receives from former students. “I like to empower people, and it’s very thrilling for me to keep getting success stories back from people who fight back and win,” Fein said. CCSF student Ashley Suehiro says she feels safer and more empowered now that she is taking Dr. Fein’s class. “I was a victim of domestic violence,” Suehiro said. “So I decided to learn new techniques to defend myself and help with my confidence.” She is now majoring in victimology, a branch of criminology which studies the relationship between victims and offenders. Suehiro hopes to become a therapist and use her self-defense training to help others. Fein posts success stories on her website, and uses them as teaching tools to inspire her students. She also shares her personal self-defense experiences with the class. One of these stories involves her being threatened at an art exhibit while carrying expensive photography equipment. “I looked up and I was surrounded by six (attackers). They came in like a pack of wolves,” Fein said. Once approached, she assumed a fighting stance, screamed aggressively and “turned into the incredible Hulk.” The men backed off. In addition to the physical skills she teaches in her class, Fein stresses the psychology of self-defense. Fein believes that most attacks can be prevented by remaining alert. Her greatest annoyance is the sight of people walking around in public engrossed in their phones. With continued practice of the self-defense techniques taught in her class, Dr. Fein says her students will build the muscle memory necessary to act instinctively in an emergency.